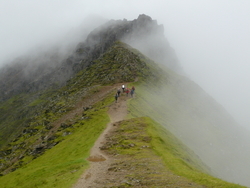 Take on one of the 3 highest points in Britain and climb the highest peak in Wales, Snowdon. At a height of 1,085m Yr Wyddfa towers over its neighbours and affords us with stunning views over Snowdonia National Park as well as out to the sea towards the Isle of Man and Ireland. A beautiful - and challenging discovery of Snowdonia's highest peak. Your trek to the summit of Snowdon will take you away from the traditional trails used by climbers to reach the Summit. Approaching from the west our trail will follow the Snowdon Ranger Path which is thought to be the oldest of Snowdon's six trails to the summit. Starting at Llyn Cwellyn the Rangers Path will take you through a wide range of mountainous environments and allow you to take in some stunning views - an experience not to be missed! 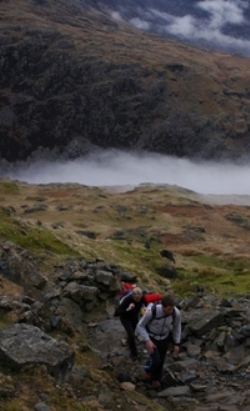 2 x nights accommodation, 2 x breakfasts, qualified mountain leader/first-aider, group safety equipment. Transport to/from North Wales, very short transfers to start of walks (we can organise lift shares in our vehicles plus yours if necessary). By nature all activities contain an element of risk. Your leader will be first aid qualified and will carry the appropriate safety kit for the activity, such as mountain safety shelters, walking rope and from time to time mobile radios. Safety equipment carried will be appropriate to trip. The leader's primary role is to ensure your safety, but it is your responsibility to listen to their guidance and instructions. Due to Snowdonia’s position on the Western Seaboard it bears the brunt of prevailing weather systems coming in moisture laden from the Atlantic. At this time of year the weather could go either way from warm temperatures to freezing cold so be ready for anything. Make sure you pack according to the list! Remember that layers are the key, allowing you to adjust your level of warmth more easily. We will almost certainly experience some rain during the run, so make sure you have suitable waterproof gear both top and leggings.